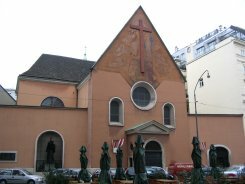 Those who like to experience raw history should take the time to find the Capuchin Monastery (Kapuzinerkloster) in the very center of Vienna and visit the attached crypt. This is the Imperial Crypt, the Kaisergruft, colloquially known as the Kapuzinergruft. The last resting place of dozens of Emperors, Empresses, Archdukes and their spouses and offspring. The accumulated corpses of one of the most famous dynasties in world history: the Hapsburgs. Here you can stand within touching distance of Maximilian I, Emperor of Mexico, or Empress Maria Theresia and her husband Franz Stephan, the Holy Roman Emperor. Or Empress Elisabeth — Sissi — the 19th century’s answer to Princess Diana, who still attracts cult-like interest today. The Kapuzinergruft is a place of strange contrasts. Anyone expecting a musty, dank, dark chamber of horrors is likely to be disappointed. Instead, the crypt’s chambers are large, well-lit and airy. But that doesn’t take away from the starkness of the place, with its bare walls and row upon row of large ornate sarcophagi. A sense of sadness certainly hangs over the place. Death as the ultimate leveller. That despite the wealth, fame, power (and expensive coffin), all that is left is a body in a box to be stared at by a few itinerant tourists taking hurried snapshots before the next stop on their Hapsburg Tour. As well as a ticket, you’ll want to buy an English guide and map, too. Inside the crypt, there are no information displays (though it’s been a while since I visited), just the names of the dead inscribed next to their coffin or on a stone board on a wall. If you don’t linger, you’ll be finished in no more than 30 minutes. But take the time to look closely at the intricate decoration on some of the coffins. These are made mostly of lead, pewter, bronze or copper. Silver and gold were used sparingly, not least because bits used to get stolen by visitors. The most impressive section is the Maria-Theresia-Gruft, a domed chamber dominated by a huge, complex sarcophagus for the Empress and her husband. The same chamber houses many of her 16 children. One of those is her eldest son, who became Emperor Joseph II. His coffin stands at the entrance of the chamber and is a simple copper design, standing in remarkable contrast to that of his parents. Joseph II was famous for his rationalist approach and distaste for ceremony. Another must-see is the Franz-Josephs-Gruft, the chamber that’s home to Emperor Franz Joseph I, his wife Empress Elisabeth and their son Crown Prince Rudolph. Elisabeth was famously assassinated by an anarchist in Switzerland. Rudolph took his own life. His death saw the succession pass to Franz Joseph’s nephew Franz Ferdinand, whose assassination in Sarajevo sparked the first World War. Subway: U1 and U3 to Stephansplatz or U1, U2 and U4 to Karlsplatz.